My reaction to finding this article, in which neighbors complain about an Amateur radio operators antenna, was to remember how important Amateur Radio is. Amateur Radio operators (known to one another as Hams) continue to provide the only long distance rapid communication in and out of regions on public, open airwaves during revolutions, disasters, military crack-downs, etc. when totalitarian governments or military coups have attempted to stop all other forms communication by blocking telephones and internet. Autocratic regimes now seem to be able to easily shut down cyberinfrastructure entirely and in short order, as evidenced from the cases in Burma, China and Egypt. However, in most of these cases Ham Radio operators serve as a remaining link in and out of the closed borders – routing information, not necesssarily via morse code (though some do) but through voice communication and the exchange of call signs. Ham radio crosses geopolitical borders and boundaries easily and regularly. I grew up around it because my dad is an operator, and as a kid, the hundred foot antenna over our house was the object of much speculation by neighbors. But this tower allowed him to talk to people all over the world, freely, long before the internet. And as a kid I would sit in his station and scan the dials listening carefully for the codes, “dits and dahs” of morse code, the time broadcasts and chatter across the airwaves, and even got to hear the radio communication between NASA and the space shuttle. 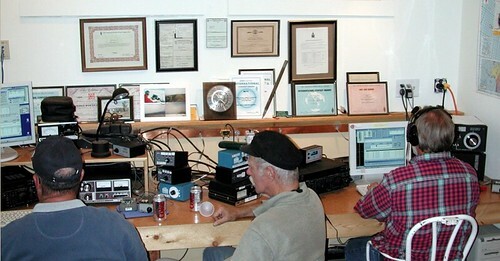 Hams call out “CW…CW…” seeking contact with other Hams across the globe not to annoy neighbors, but to maintain free communication over the commons of the airwaves.